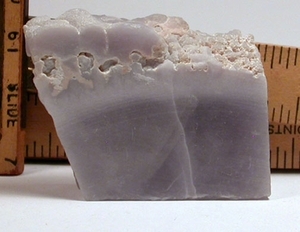 At 1/2x 1-1/2x 1-7/8", this botryoidal yttrium fluorite has been cut to show its' rare growth habit through section and natural edge. It self displays in several ways and would make a lovely pendant and/or altar piece. While good translucency may make you wish to show it off, keep from sunlight to preserve its' natural pale-to-deep lavender coloring.